I decided I needed to include a brief description of how to make homemade vanilla extract. I bake so much (and make so much ice cream) I have to make my own vanilla or I would go broke. It is also the best vanilla ever! Vanilla beans can be expensive so I usually buy mine online at Firehouse Pantry, or in a pinch, Amazon. I buy 4 oz at a time which keeps me in business for a few months. 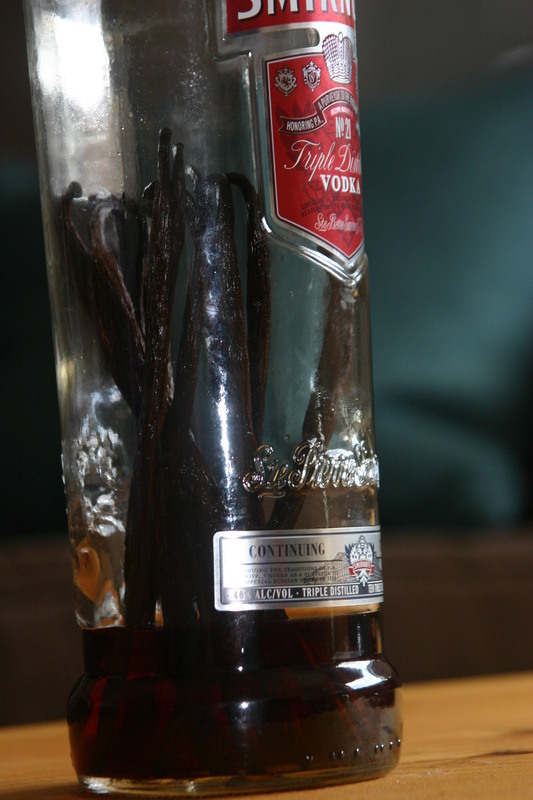 Place the vanilla pods in the bottle of vodka, screw on the cap, and set aside for about 3 months. You will know when the vanilla is ready when the vodka has turned brown and you smell vanilla instead of vodka. I keep mine as is, just pouring off a little at a time to fill a small bottle for daily use, until I have used all the vanilla extract.